SmartWater’s Steve Mills, a former crime squad officer, shines an ultra violet light to identify stolen equipment and entrap thieves with Area Manager John Das Gupta and Andy Bevon (left), of Shropshire Fire and Rescue Service, at the scene of a “first ever” crime at Albrighton Fire Station. 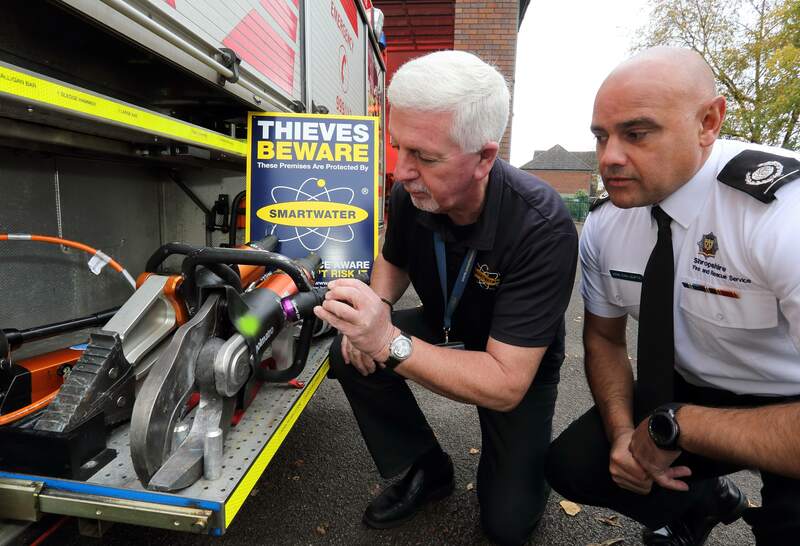 Shropshire Fire and Rescue Service has called in SmartWater, the successful crime deterrent and “thief catcher,” to protect equipment from further raids in all 23 Shropshire fire stations. Every single piece of firefighting kit, from hoses to Holmatro cutting gear, is being forensically marked with SmartWater. Security fences, door entry systems, motion detectors and CCTV are also being installed to protect fire stations in a crime prevention exercise predicted to cost £150,000,” said Area Manager John Das Gupta. The fire and rescue service has been forced into the move after heartless raiders smashed their way into fire stations in Albrighton and Newport to steal heavy rescue equipment, worth more than £70,000, used to cut casualties free in road crashes. Albrighton firefighters were unable to attend 999 calls needing the rescue equipment for a number of hours until it was replaced with fire and rescue cover provided by other fire stations which increased travel distances and attendance times. “Our fire stations have not been targeted before. Despicable criminals have reached a new low by stealing equipment used to save lives. It is an attack on the community which we are here to protect and now we have to invest huge sums as a result,” said Mr Das Gupta. He said lives had been put at risk by the thefts with firefighters from Albrighton and Newport unable to attend collisions on the nearby A41 route. Gary Higgins, Director of Security Services at SmartWater said: “Shropshire is the home of SmartWater and we are proud to be working with Shropshire Fire and Rescue to help protect our fire stations and lifesaving equipment. SmartWater scientists created a unique, clear water based forensic formula, for each Shropshire fire station. Invisible to the naked eye, the solution glows yellow under UV light and forensic scientists only need a speck to identify where an item was stolen from or to link criminals back to the scene of their crime. Deterrent SmartWater signs have also been displayed, sending out a powerful warning to would-be thieves, he said. Thieves first attacked the Albrighton station in June when neighbours raised the alarm after seeing three men acting suspiciously in the early hours. The equipment was taken from a fire appliance which had been forced open. Less than two months later a second night time raid was carried out at Newport fire station and equipment stolen and a fire appliance damaged.